If I were to design a simple new RPG it would not have advancement. Much like Traveller. So how do you get an ever changing game experience? Different spells might be a way. But what I would like to do would be the adding of powerful named enemies. Nobody knows you at first, you have no friends, and no enemies. Later, you know more about the world, you have made friends, and you have made enemies. Personally, I think that “inner changes” and growth as a person don’t need rule support, that just works as-is. I guess the reason I was thinking of this was a podcast episode by Ray Otus I just heard about Advanced Sellswords and Sorcery. The idea was to have some sort of “advancement” which meant being able to take more wounds (being able to have more negative tags/aspects before being taken out) and I thought to myself: but this just makes combat longer, that’s boring! Have you ever played Traveller? It doesn’t have any meaningful advancement at all. The only thing that changes over time is that you might have more money, better equipment (including a starship, of course). I still think it has long term appeal. Same with the basic idea Fate as I see it: you might shuffle the skill pyramid around, but you’re not going to actually get better in absolute terms. And that suits me fine. Even though it’s very different from the D&D family of games. At least, that’s how I remember it. On Mastodon, @hawkjohenson remembered some sort of advancement (adding more skill points to the skill pyramid), but we both didn’t check the books. The Fate rules I read and used were Spirit of the Century, Diaspora (and that Mass Effect game based on Diaspora, not the other one), and some reading of Fate 2 way back when I revised my own Mesopotamian Fate variant (in German) – and I never noticed a way to grow the skill pyramid. I just reread my own Fate variant and it mentions switching skills in the pyramid and removing consequences and the like – but not getting more skill points. What I am looking for is the promise of changing gameplay over time. Classic D&D achieves this in a way with spell levels. The game with and without fly spell is very different. Same with a host of other spells. To take a very different example: I love how the gameplay of A Dark Room changes over time. So breaking away from that single axis of change (in the words of @halfjack) is central. That is also why I don’t want to play a variant of D&D where characters get more and more hit-points and it’s all about the attrition, the slog, the grind, the endless back and forth. This happens if hit points are inflated, or special attacks like level drain and various save-or-die effects (poison, petrification) are removed from the mid-level game. If these are not in effect, then all you are left with is the slow back and forth of melee. Ideally, however, combat is over in two or three rounds when I run the game: at low levels, two or three hits should take people out; at higher levels, it’s spells, save-or-die and level drain and similar attacks that speed things up. That’s also why I don’t want the armour class of the opponents to increase as the attack bonus of the characters increases. If you do that, nothing changes. I’m fine with fighters hitting every single round at higher levels. It’s supposed to feel different! Changing gameplay is more important than more staying power, better chances to hit, or similar “advancement”. I keep wanting to go back and run a Traveller game. But this seems to be my curse: writing software for games I don’t play. Like other people reading rules for games they don’t play, or buying materials they don’t use. 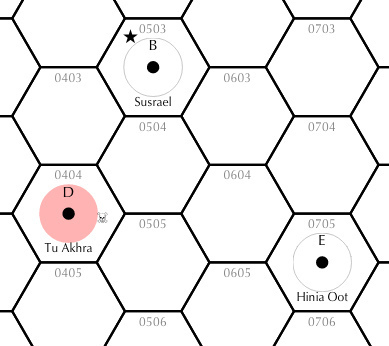 Well, in case you want to run a Traveller game, check out this Traveller map generator. Please note that generating the map for a whole sector takes a few moments. Subsectors are much faster. I just added something new to it: languages. For a long time, the map generator would pick a “language” and generate names that belonged to this “language”. The name generator is also available as a separate tool. I felt that over the centuries, there must be settlements and growth, decay, something like migration. And thus the names should stick around. After all the systems on the map are named (using the language of the ancients, I guess), I go through all the systems again. Every system has a 5% chance of having developed a dynamic culture with it’s own language and names. For every culture that’s thus generated, I determine whether it has access to Jump-1 or Jump-2 drives (50% each). And I decide for how many jumps they will spread: one to three jumps. If they arrive at a system where another culture has already taken root, there’s a 50% chance that they won’t settle and expansion stops. This expansion also renames the systems using the new “language”. When I’m done, it’s time to pick colours. Sadly, I know very little about colours and so I just have seven colours prepared and each culture gets one of them. That also means that sometimes regions with the same colour will touch and appear to form a single area. Well, I guess these are multi-lingual empires. System not touched by these expansions keep their names and the white background. There are still unresolved questions, though: is the red area in the lower left really a merger of several larger cultures that all happened to end up red? Here’s some debugging output. What you see is a line showing where the expansion started, the colour picked, the jump drive quality (1 or 2), and the expansion (1 to 3, going down by one with every step). I filtered the entire output for the area of interest: x coordinates from 01 to 09 and y coordinates from 30 to 49. Every line is prefixed with it’s line number, which should make it easier to spot gaps. As you can see, there was a culture that started in 0840 and grew into 9 more systems (with some growth outside the bounds that we’re looking at) but the culture which started in 0935 gobbled half of it up. A Jump-2 drive and a drive to expand up to three jumps makes a massive difference. Just to make sure that the remaining lines did not hide anything important, I went back to the file: 63 systems! And now we come to the colouring. This is culture 009 and 023. The CSS class is computed by taking this number mod 7 + 1, resulting in 3 for both, and the class culture3 uses the background #fff0ff (some sort of plum, I guess). I’d say the next improvement would be adding some more colours before fiddling with the algorithm too much. Do you think languages should spread along trade and communication lines? Or should they spread out based on how close systems are? For example: if a civilisation had mastered jump-1 but not jump-2, the language would have spread to neighbouring systems that can be reached with their ships, independently of whether the economics later warrant trade and communications? Words for certain products like tea in our world have spread far and wide. Thus, is trade the most important aspect? It’s a good point. As a counter point I can only offer that languages often seem to be contiguous areas in the world, both rich and poor, and that the major trading centres of the world don’t all speak the same language (even if the merchant class would speak Roman, or English, or Portuguese). So the names of new products might travel with products, but language itself seems to spread organically, from family to family, as people slowly move from place to place. I guess it also depends on whether you think that the sophonts present are there due to local evolution or due to settlement from nearby systems. If nearby systems, then the first language group to arrive is simply going to dominate, even if trade later fails, I’d assume? So, I’d argue that easy of travel is irrelevant as long as somebody did the actual travelling. Perhaps isolated worlds should simply get their own languages. I think I need to avoid diving into this rabbit hole! No overthinking! Just focus on making a nice map that serves to inspire a referee. Named the cultures in the UWP instead of simply numbering them. Colours are used in random order. And a Mastodon bot: @traveller! Hm, need to think about the Trader Format. This doesn’t seem to work. I was wondering how to give each random Traveller sector or subsector generated its own “touch” and I remembered the notes on generating names for the Twitter bot @unchartedatlas. My generator uses a digraph based random generator, an idea going to back to the original Elite. What I’m doing now is randomly generating the list of digraphs to use for each sector or subsector, thus making the generated names more or less similar to each other. If you want to experiment with the name generator on its own, I installed it as a separate web application. Perhaps it can be useful to generate random names in fantasy languages. The Help page shows how to start with lists of digraphs based on the Japanese and Hawaiian language. I then added code to parse multiple characters as one – moving from code digraphs to linguistic digraphs like “ch” or “th”. These can then be counted as a single consonant. The Traveller generator now picks a random subset of English consonants and vowels, including some digraphs, as I said, and I think it works rather well. I’ve been comparing the subsector generation of Mongoose Traveller (MGT) and Classic Traveller (CT) in the incarnation of The Traveller Book. The distribution of starports is different. Note how Classic Traveller has only a bit less D and a lot more A starports. Bases are different: Mongoose Traveller has Research, Traveller Association, Imperial Consulate and Pirate bases; Classic Traveller only has Naval and Scout bases. Temperature is different: Classic Traveller does not have it. Then again, I was always confused by the fact that it doesn’t show up in the Mongoose Traveller Universal World Profile (UWP). Hydro is different: Mongoose Traveller has a modifier for temperature; Classic Traveller does not. That explains why temperature doesn’t appear in the UWP: it wasn’t used by CT.
Population is the same and limited to a maximum of A when rolling, but the table in Mongoose Traveller also describes B and C. Perhaps this is a nod to Coruscant, the world city in Star Wars? Government is the same and produces a range of -4 to 15 (F) when rolling. Both only describe governments 0 to 13 (D), however. How strange. Law is similar in that the dice throw produces a range of -5 to 15 when rolling, assuming we limit Government to 0 to 10 (A). Mongoose Traveller only describes Law 0 to 9; Classic Traveller describes Law 0 to 10 (A). Tech is different. Mongoose Traveller has modifiers in the table for populations B and C, but you can’t get more than A so this is a bit strange. Mongoose Traveller increases Tech by +1 if you have Hydro 0. Mongoose Traveller increases Tech by +2 if you have Government 7 (Balkanisation), which is weird. Mongoose Traveller decreases Tech by -2 for Government 12 and 13 (charismatic oligarchy and religious dictatorship); Classic Traveller only does this for Government 12. No penalties for religious dictators, I guess. Trade is also different, mainly in that some codes are missing in Classic Traveller: Barren (Ba), Fluid Oceans (Fl), Garden (Ga), High Population (Hi), High Technology (Ht), Low Population (Lo), Low Technology (Lt). Travel Codes (Red, Amber) are not codified in Classic Traveller; Mongoose Traveller suggests when to use the Amber code. Routes appear only in Mongoose Traveller. 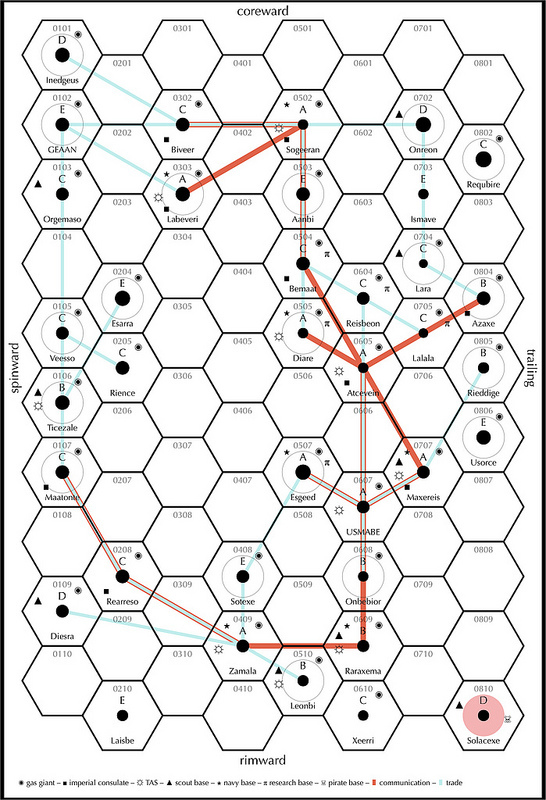 The pirate bases, the travel codes, and the routes sure make the maps generated for Mongoose Traveller more interesting to look at. Here is an example subsector generated. Notice the limited bases created. I decided to drop the optimising I had been doing, to get a feel for the “raw” data. This also required some rewriting and this always messes with the random number generator. That’s why this map cannot be easily compared to the one above. I did some rewriting and added the minimal spanning tree algorithm again. It looks less busy, the clusters are still clusters. But there are some drawbacks. Take a look at the top right corner: 0802 and 0703 are connected (distance 1, shorter connections go first), 0701 and 0703 are connected (distance 2), and thus 0701 and 0802 cannot be connected because that would introduce a loop. I think for the time being I’ll remove the minimal spanning tree optimisation again. Not sure about the colour scheme. And the legend at the bottom needs fixing. Nice, I like the red to highlight the J-1. When I did my subsectors, I ended up not rolling for the J-3 and J-4 routes. I also didn’t bother with a J-2 route that was already connected by J-1 (for example 0604-0804 above, there’s already an implied J-2 route as 0604-0705-0804). Similarly you could remove the 0305-0604 J-3 route (unless there isn’t a J-2 between 0305-0505 and that blue line is actually JUST a J-4 route 0305-0705...). Which means it’s not cheaper (time wise) for a starship to call in at an intermediate port. So given a choice between A-B-A and A-A most people will still choose A-A by preference because it gets there in half the time. It has a greater efficiency. As for trade route optimisation: one might say that the trade routes indicate the most popular trade routes and thus two jump-2 segments will be more popular than a single jump-4 segment because there will be more ships that can handle it, even if that makes the route take twice the time. Well, that was my argument when I realised that too many routes just made for an ugly map. So basically the jump-2 route 0604-0804 says that ships can and will make this jump directly – unlike the jump 0604-0703, which is also a jump-2 but somehow the dice have decided that it’s not profitable enough to do. It’s up to the referee to explain the difference. At least, that’s Ian’s argument. For myself, I’m still undecided. All I can say is that it looks busy and messy and I don’t like it too much. As for distance, I guess from a player perspective, at the beginning of a typical campaign all we care about are jump-1 and jump-2 routes. Perhaps I should just use a third colour for jump-2 routes. Support for sectors, click to zoom. Note how I used a third color for jump-2 routes. D’oh. I just noticed that my generator never generated any gas giants. Fixed! This also means that all the random seeds will now generate different maps. Nooooo! Definitely an A class spaceport (and it will have an attached Imperial naval and scout base). It probably should be a Rich world (Atmosphere 6-8, Population 6-8), and I’d assign it a Government Type of 8. The TL should be amongst the highest in the subsector (and a minimum of 12). This is the approach I would take. 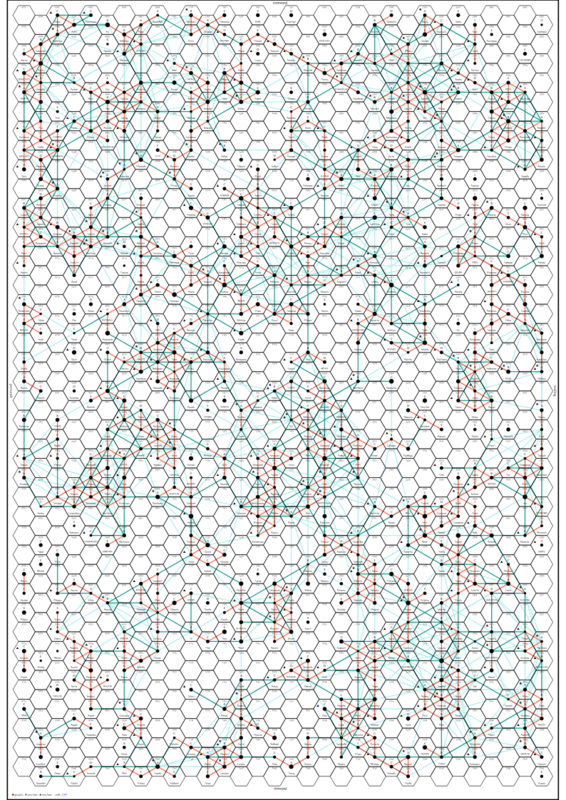 First generate the main routes. (1) Connect all Starport A within Jump 2 of each other. (2a) Connect all Starport B within Jump 2 of a Starport A. (2b) Connect all Starport B within Jump 1 or each other. (2c) Connect an unconnected Starport B to another Starport B within Jump 2. If a connection in step 2 connects Starport A to the sector capital then upgrade it to a main route. Next comes the feeder routes. (3a) Connect Starport C to a single Starport A within 1 jump. (3b) If not connected, connect Starport C to a single Starport B within Jump 1. (3c) If not connected, connect Starport C to a single Starport A within Jump 2. (3d) If not connected, connect Starport C to a single Starport A within Jump 2. (5) Class E starports are never connected by a trade route. If in need of direction, assume the shortest path to the subsector capital. This defines the regular services (for various definitions of regular). Everything else relies on tramp freighters. One thing I did to simplify my route maps is that if you have three worlds, One, Two, and Three, and there is a J-1 route from One to Two, and a J-1 route from Two to Three, I also assume the J-2 route from One to Three is also regularly travelled. I also in a few places, having rolled just the J-2 route, assumed that the J-1 routes were thus also regularly travelled (this makes a world that might otherwise have had less access have more, I’m not that bothered by that, and would rather have a simpler map). With my renewed interest in Traveller comes a new blog, Tales to Astound! OK, so the only weird thing is that sometimes there is no UWP link back from the map, right? Well, if you’re looking at https://campaignwiki.org/traveller/edit/344450615 and click on Generate Map then you can always use that id in the URL and type https://campaignwiki.org/traveller/map/344450615 into the address bar of your browser. And now the missing UWP link appears! I don’t even know why I’m posting all this. I makes me realise that the user interface needs more tinkering and I’m tired. If you have an idea for how to make it more obvious, specially if you haven’t used it before and you’re confused, I’d like to hear about it. Perhaps we can improve the web app together. Made some changes, and added random sector generation (32x40 instead of 8x10). Amazing! I am doing a piece on my podcast discussing Traveller maps and will def be mentioning this. What a gift! Why is classic Traveller the simple generic system that drives adventure? My Favorite SF RPG… talks about all that. The PCs can’t do everything, of course. The character generation tables offer a limited set of skills, and PCs will only have a few of those per PC. But this means that if the PCs don’t have the skill set available they will have to come up with adventure-driven schemes and shenanigans to keep going: steal the part they need to fix their ship because they don’t know how to fabricate it; get to the professor of ancient languages held against his will on the estate of the noble to translate the alien tablet they found; sneak into the government building using a clever ruse because this group doesn’t have someone with Computer skills; and so on. Deciphering the Text Foundations of Traveller is a rabbit hole about the literary sources of Traveller. The creators of CT wanted the anarchic, amoral, and violent adventure of fantasy role playing translated into a science fiction setting. Travellers in a country that isn’t open for tourism, ex-military guys, characters in Tales of the Quintana Roo, can’t resist someone saying, “Man, you have to see the Erradeca temple ruins! A group of us found a guy who can show us the way.” Ex-military guys are rootless, have time on their hands, a certain confidence and hunger for new experiences, and have skills most other folks don’t have. I think Marc Miller originally designed a game that’s truly about the kinds of characters who love travel and new experiences, like military folks he knew. This closely matches Andre-Driussi’s take. Screw the focus on owning a starship. These characters aren’t about being in space. They’re about experiences on planets. The original focus of the game is why you have stuff like the Traveller’s Aid Society and ship passages that no one ever does anything with. The characters don’t want to own ships. They just want to get from place to place. It’s called Traveller! I’ve thought a lot about why it got drifted to a tramp merchant thing in the first place. I think the answer may be that it’s not easy at all for players to get excited about seeing an alien ruins, or a once-in-a-hundred-years creature migration that has to exist entirely in their imaginations. Here’s a Classic Traveller Character Generator by Paul Gorman. I wrote a Traveller Subsector Generator. See the screenshot at the top of this page. Or you can use Text Mapper. I think you could run a campaign just looking at concept ships all day. Oh, and if you’d prefer a fantasy game instead, Paul Elliott has Mercator for you. An Interview with Marc Miller. Jeff Rients has you covered: Traveller: Where to Start. Basically, one of the old sets. These days, you can also use Mongoose Traveller. As far as I can tell, it’s main benefit is that it has a unified task resolution system. Just roll 2d6, add all the modifiers and get 8 or better. But Jeff says: «I think a single resolution system for all actions is not the right way to run Traveller. Detractors of the original rules like to say that Classic Traveller’s big flaw was lack of unified resolution mechanics. I consider that a feature, not a bug.» I guess it makes it more obvious that the referee sets the difficulty level of all rolls. That works for me. I think the post you quoted from Martin Ralya gets to what I’ve always felt was the core of the Traveller game. Instead of characters who work to travel from interesting port to interesting port, in many cases a starship becomes the characters’ new home, which fails to capture the itinerant nature of the setting. This is fine as far as it goes, and of course people should play the style of game they like, but I think the game is much more interesting when players look to their characters’ backgrounds as a way of dealing with ever-changing circumstances of all types, than as a straitjacket to lock characters into a specific campaign style, be that paramilitary or trading or empire-saving. All I can say is that my Traveller campaign folded. I got charmed by Diaspora and half a year later we switched away from Traveller. Micro management of the wrong kind of things was part of the problem: no body cared about trade and payments, and yet we felt this is what the game is all about. I bought The Traveller Book (1982). According to Guide To Classic Traveller: «The Traveller Book consolidated the core rules (Books 1-2-3) into a single 8.5 x 11 book and added additional material on how-to-play the game. It also added the short adventures Shadows (from Double Adventure 1) and Exit Visa. 159 pages hardcover with dust jacket, or softcover.» As my campaign ran using Mongoose Traveller, I am interested in the differences. Google has some forum threads for me to look at... but they make me tired. I’ll just browse the PDF, now. 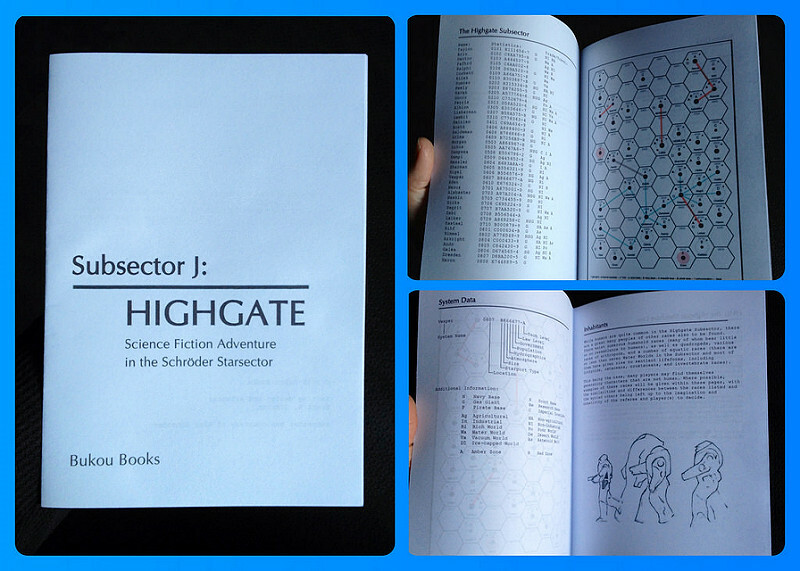 Brett Simpson used my SVG Mapper for Traveller to generate a little booklet for the subsector he’s been working on. Today I posted about my Planescape-Spelljammer-Traveller mashup on Google+ and I was asked to say more about it. Basically the players got hold of a Spelljammer ship to sail the astral sea. It was one of the classic ships: a Mindflayer Nautilus class called the Black Strangler. Basically the astral sea is what Planescape has as the sea at the bottom of Celestia. When I read about the astral plane, the big wheel and all that, I was confused and I figured the players would be as well. Instead I opted for something alike Marion Zimmer Bradley’s travel to Avalon: get on a boat, travel for a bit, use some magic and you can be elsewhere. I think the astral sea is how D&D 4E does it as well? Anyway, so we have a “sea” and “islands” on it – or basically worlds, systems. It already starts to sound like a bit of Traveller. Many of them will have gates linking them with larger worlds – fantastic worlds inspired by Planescape: hells, elemental planes, alternative prime material worlds. A bit like Philip José Farmer’s World of Tiers, perhaps? One world, for example, is non-magical except for the gate that leads to the astral sea. So they built a fortress in the astral sea and discovered that magic works on the other side. Now they use it like a space station or star port to manufacture mundane stuff that requires magic to be built. All these small worlds, astroids and stations get an UWP and I feed it to my Traveller Subsector Mapper to produce a nice map. Check out the astral sea map and click on the systems to go to the campaign wiki pages. I think my greatest inspirations from the web where the One Page Dungeon submission The Forgotten Depths by the author of The Metal Earth and the session reports on Planet Algol. Nevertheless my campaign took a while to evolve to this place. At first it was very traditional Wilderlands of High Fantasy. Then we explored the first few levels of Dismal Depth, the Fight On! megadungeon and a bit of Barrow Maze. And when a player character fell into an “infinite pit” and another player character threw himself after the first one (picture), I decided to push it to a new level.